It is difficult for me to believe that I am already 3 weeks removed from having a 3 inch (ish) plate and 8 screws installed in my elbow. While sleeping at night has been uncomfortable almost every night, and I have been carrying that pillow with me everywhere for those three weeks, overall, things are getting better and I am happy for it. I had my second post-Op doctor's appointment yesterday, 2 weeks and 6 days after surgery. As I mentioned in yesterday's post, it was my hope that he would tell me "no more splint!" at the appointment. I was also looking forward to the opportunity to see my arm again, check out my incision, and potentially itch the crap out of my forearm, which had been bugging me for a few days. Sticking a pencil in between the wrap on your arm is not really recommended, so I was doing my best to avoid that. Other than those hopes, I wasn't sure what the appointment would entail. New steri-strips? Being sent downstairs to the PT unit? More x-rays? I got my bandage taken off right away, and I let my arm set in the splint and scratched the heck out of it. Here are three shots of the 'bow to show it's progression. Sorry that the shot from yesterday is turned the other way, I couldn't figure out how to rotate it and for some reason my computer was not letting me! Regardless, you can see how my forearm and wrist have atrophied just in 3 weeks. It's amazing. My bicep is even worse. But I know that it will get back to normal once I am able to begin using it again. 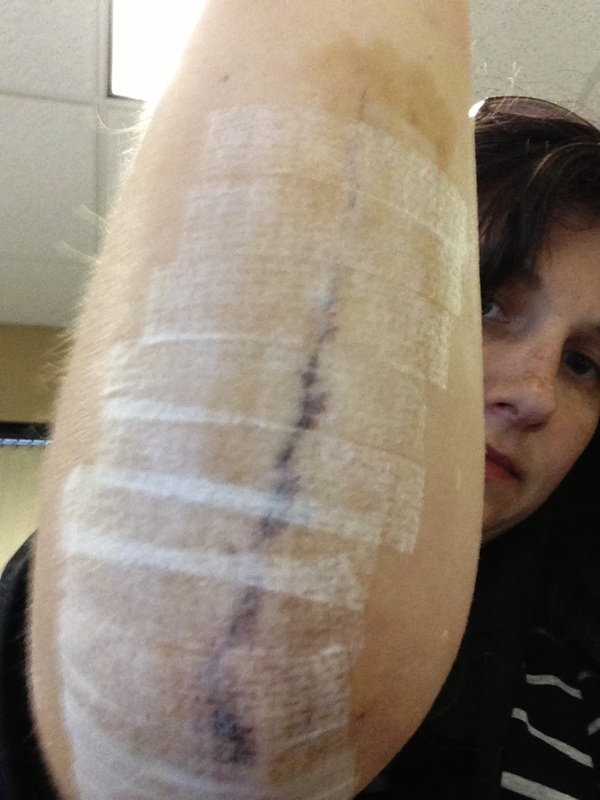 He checked out the incision, let me know that it was looking great, and replaced the steri-strips on it. I had dissolvable stitches and they are gone. Then he held my arm out and straightened it, well, attempted to. I winced as it was stiff and it HURT. He said, "ok, we'll get you set up in physical therapy. And no more splint!" In my head I start to rejoice! He said I could continue to wear the sling sometimes for support when I feel like I need it, so I left it on for the rest of yesterday and skipped it for work today. I think I may wear it when I get home for a little while though. I set myself a goal. I want to be able to straighten my arm (even though it will likely hurt) by the end of the week. So by Sunday night, it will be mine! I was working on it a little it bed last night with it resting on a pillow, just kind of pulling it out... And today I carried my camelbak water bottle in that hand just to let gravity help me out a little bit. I have been typing with two hands though today, which is definitely making blogging go much faster! I took this picture at the office yesterday. And yes, it was an iPhone pic, hence the strange proportions. Regardless, it gives you a sense of just how large this incision of mine is! It wraps around the elbow over the joint and everything, which prior to seeing it for the first time, I was not expecting! And yes, it is a pic through the steri-strips, but if he (the doc) thinks it looks good, I am going with it! Wish me luck at my straightening goal!